Vasconcelas was the dominant partner, hitting 126 not out, as he and fellow opener Rob Newton posted an unbroken partnership of 234, with the latter making an unbeaten 85. 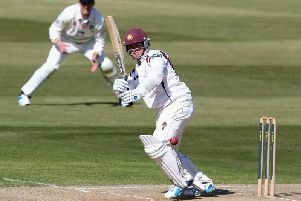 At the close, Northants still required a further 187 runs to avoid the follow on, but on the evidence of the first two days play, there is little prospect of a positive outcome on such an unresponsive strip. Glamorgan added 137 runs to their overnight score in the morning session, before declaring during the lunch break. They lost Billy Root to the fourth ball of the morning, when the debutant left hander struck a low catch to backward point. 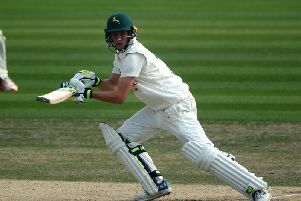 Root and Kiran Carlson had added 172 for the fifth wicket, before Carlson who added a further 10 runs to his overnight score, was taken at first slip. Needing a massive 421 to avoid the follow on, Vasconselos and Newton set off confidently, with Vasconelos striking two boundaries in Michael Hogan’s second over, and the 21-year-old from Johannesburg, who has a Portuguese passport, was the dominant partner against the five-man Glamorgan pace attack. After scoring 56 and 79 in Cardiff last summer, the diminutive left hander was dropped at second slip after scoring 21, and was uneasy at times against Labuschagne’s leg spin, but he deserved his fourth first-class century which included 15 boundaries from 189 balls. Newton was no less effective, as the pair shared the 150- run stand, with Glamorgan, similar to Northants, using seven bowlers. The most effective was Labuschagne, who was treated with respect and ended his opening spell with the commendable figures of 11-1-29-0.